Teaching a section on visual analysis, I found that first year students responded to this photo (first asked to visually analyze the doctored photo, and then showing the original without the African-American student). 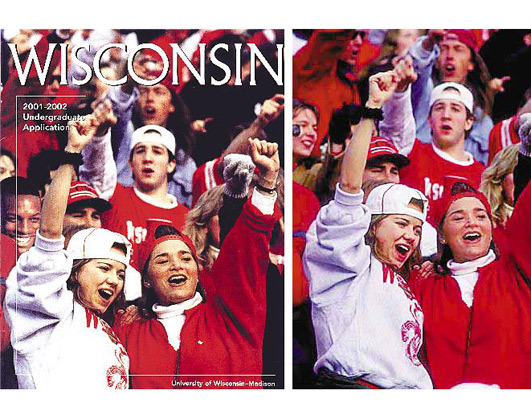 The section in the Student's Guide to First Year Writing set up the discussion well by analyzing one of UA's own marketing pictures, but the reality of how we are visually manipulated became more clear when students saw the Wisconsin example. Students seemed to be left with a 'if we can't trust the university, who can we trust?' Which is always a nice way to get students to re-evaluate/re-visit assumptions.